David S. Gebhard was a leading architectural historian, particularly known for his books on the architecture and architects of California. 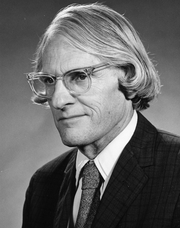 He was a long-time faculty member at the University of California, Santa Barbara, and was dedicated to the preservation of Santa Barbara architecture. David Gebhard is currently considered a "single author." If one or more works are by a distinct, homonymous authors, go ahead and split the author. David Gebhard is composed of 2 names. You can examine and separate out names.